We've already previewed World Music Day on 21 June, and we all know what other 'World' is about to happen to us, but there's an alternative celebration of global culture coming our way that sounds if anything even more intriguing. World City Music Village runs from 25 June to 6 July, with a free programme featuring the music of a bunch of nations that won't be bothering with the football over the coming weeks, plus a few that will. World City Music Village (cities and villages only please, no towns) involves a celebration of cosmopolitan music and culture across a large number of free-to-enter shows, and two full-weekend events. The festival will showcase music from all over the world, from places such as Bulgaria, Somalia, Madagascar, Syria, Bangladesh and Venezuela at venues from the east to the west of the city. The programme kicks off at 6.30pm on 25 June with World City Live, a broadcast on London's Resonance FM radio station (104.4FM) featuring exclusive interviews and performances from artists involved in the festival. The live music starts later that evening with the first of World City Music Village's 'Festival Club' evenings; this one takes place at the Kobi Nazrul Centre in Spitalfields, featuring author Romesh Gunesekera as guest speaker and a performance by London-based world music collective Lokkhi Terra. You can sample the group's excellent music below. Another of the highlights will be a performance by Simo Lagnawi at ULU on 3 July. 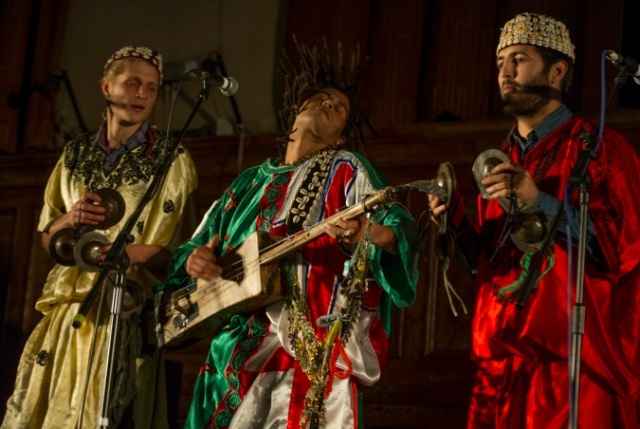 Lagwani is one of the UK's leading guembri players, that being a three-stringed skin-covered bass plucked lute popular among the Gnawa people of North and West Africa, and he'll be performing songs from his well-received Gnawa London album. The full festival programme comprises six Festival Club evening shows at venues such as The Gallery Cafe in Bethnal Green and Jamboree in Limehouse, but the dual centrepieces of the festival are the two Festival Weekends, at the National Trusts' Osterley Park and House (28-29 June), and Wilton's Music Hall (5-6 July). The Osterley Park event will include a dazzling array of artists from across the world, including Caribbean symphonies, Greek island folk, Brazilian samba and Andean 'folk songs with a rock n' roll edge'. The Wilton's Music Hall gathering the following weekend is so far less explicit about precisely who will be performing what, but you can expect a similarly eclectic line-up. And to re-iterate the point, all these events are entirely free, though you do need tickets (again, free) for the Wilton's Music Hall weekend, via the Eventbrite website. World City Music Village 2014 takes place from 25 June to 6 July, and it's free. View the full programme at the Cultural Co-operation website and find more information on the event's Facebook page. Image of Simo Lagnawi courtesy of Simon Richardson.